The late Plutarco Elías Calles is now known primarily for two things: one of which is mostly negative, the other overwhelmingly positive. He was President during one of the most tumultuous periods in modern Mexican history–just after the Mexican Revolution in the 1920s–at which time he led an infamous crackdown on the Catholic Church that led to the so-called Cristero Rebellion (In Spanish, La Cristiada). That’s the negative. The positive? Well, his name just happens to have been given to one of the world’s most picturesque places. What’s that? You’ve never heard of Elías Calles, México? Not surprising, really, given that it’s a small community with scarcely more than 100 inhabitants. But here are three reasons you definitely should get to know Elias Calles, and strongly consider buying property there. You may not have heard of Elías Calles, but chances are you’ve heard of Los Cabos, the world-class tourist destination on the southern rim of the Baja California peninsula that’s home to (and named for) cape cities Cabo San Lucas and San José del Cabo. Yes, that place, the tropical paradise with the gorgeous beaches, championship level golf courses, celebrated chefs and nightlife, and some 350 days of sunshine a year on average. Well, Elías Calles is located on the Pacific Coast of Baja California Sur, about halfway between Cabo San Lucas and Todos Santos, a surf-friendly artists’ colony that just happens to be a major tourist destination in its own right, and was the first place on the peninsula to be officially designated as a pueblo mágico (literally, “magical town”). Elías Calles is thus conveniently close to two popular tourist destinations. What that means is easy access to all the attractions of both Los Cabos and Todos Santos–from shopping and fine dining to surfing, fishing, golf, spas and frequent cultural events–but also peace, quiet and all the other joys of small-town living. Plus, of course, breathtaking, horizon-stretching views of the boundless Pacific. Few three-word assemblages engender more excitement than “affordable beachfront property.” Even in Los Cabos, beachfront land and homes list for significantly less than similarly situated coastal properties in the U.S. and Canada, and come with the added benefits of significantly lower property taxes and a significantly lower cost of living. In tiny, little-known Elías Calles, the values are off the charts. 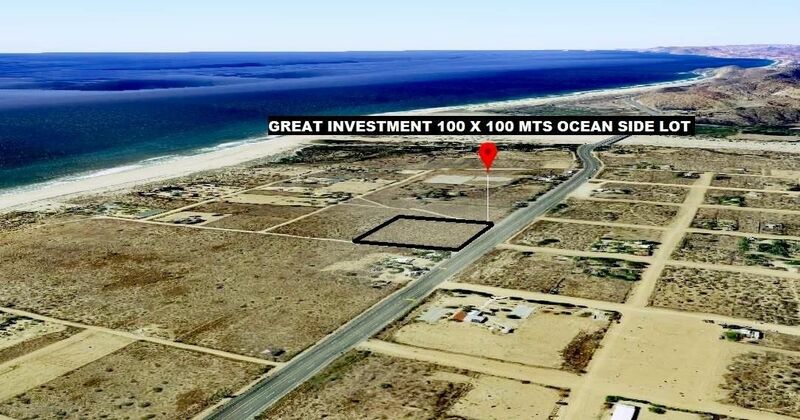 Not only is beachfront property there a virtual bargain, even compared to Los Cabos, it’s also an excellent long-term investment, sure to benefit from the continued growth of the tourist destinations to its north and south. And as to what surrounds it on the west side, let’s just say no one is making any more oceanfront property, and leave it at that. We’ve characterized beachfront land and homes in Elías Calles as certified bargains, magnificently situated properties available at extremely value-oriented prices. But we’ve also said it is a tiny community, with scarcely 100 residents. Do we really need to connect all the dots for you? Yes, there are several great property listings at present for Elías Calles, but the window of availability is, by nature, very limited. Just as no one is making any more beachfront property…Elías Calles can only get so much bigger, and for that matter, why would anyone want it to? Small-town atmosphere and an oceanfront setting are its two major charms. So learn the name, learn it well, and by all means learn it fast! Whether you are seeking condos, villas or Oceanfront Living in Elias Calles, it is absolutely essential that you choose the right ally to help you navigate the entire process, from site visits to closing costs. That’s where Windermere comes in. Windermere is one of the most respected names in North American real estate, with over 300 offices and 6,000 agents in the Western U.S. and México. The company has deep roots in Los Cabos, where its agents have over 100 years of collective experience, as well as an exhaustive knowledge of available local listings and the intricacies and legal requirements of buying and selling property in México. Windermere is the ally you want when it comes to finding your next home.